There’s a lot of information out there about exercise and periods, including a fair share of menstrual myths. There are lots of menstrual myths, classics include ‘Exercise will make your cramps worse’ (Wrong: it actually has the opposite effect, helping to ease the pain). Many of these have endured from a time when talking about periods was taboo at worst and a bit of a mystery at best. Thankfully we’ve come a long way. And now there’s nothing we want to do that we can’t, just because of a little bit of blood, right? Right. But understanding the four phases of your menstrual cycle and the science behind the exercise you choose to do each month can definitely help to make life a little more comfortable. And it can also make a big difference to how effectively you train. Georgie Bruinvels, an MPhil/PhD student at UCL and a visiting Research Associate at St Mary’s University, London, UK, has been studying the effects of the menstrual cycle on the performance of female athletes. She’s an athlete herself. A cross country runner, Georgie hit the headlines in 2015 when she won the Manchester Marathon on her first ever run. Our iron levels change throughout our menstrual cycle. So are female athletes noticing a difference in performance, based on where they are in their own cycles? Many athletes dread competing on particular days of their menstrual cycle, fearing it will affect their performance. And some days can be equally as challenging for those of us who simply enjoy our regular exercise, too. 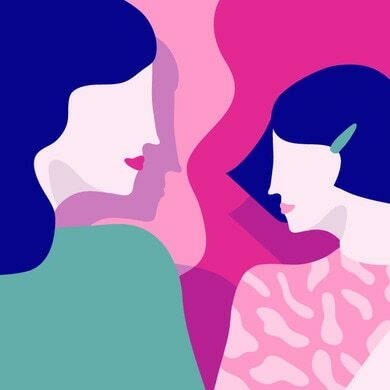 “What we’re doing with our research is gaining a better understanding of the issues, what happens to the body during the menstrual cycle, the treatments available, and the things women can do to help restore both their iron and performance levels,” says Georgie. And that’s good news not just for the world’s top female athletes, but for you too. Georgie’s discovered there are plenty of things you can do to carry on exercising and training happily and effectively throughout the month. With some stages of your menstrual cycle actually adding power to your performance – who knew? All of us will have some days during our menstrual cycle where we’ll feel like staying in bed with a hot water bottle. But Georgie’s research has confirmed that exercising at every stage of your period is not only safe, it’s really good for helping with those aches and pains too. One of the hardest times to keep exercising is during the ‘Strength’ or ‘Bleed’ phase in your cycle (days 1 to 5), when you’re on your period and your uterus is shedding its lining. Your oestrogen and progesterone hormone levels will be low, leaving you feeling tired and perhaps even a little sad. You could also be experiencing stomach cramps. But try not to let the cramps slow you down. “You probably won’t feel like it, but you have to try and get out there and exercise during your period,” advises Georgie. Gentle activities like yoga, swimming and walking are good, or try doing some stretching or lengthening of the body to help with any cramps. Strength exercises will actually be much more effective during this phase when there’s less progesterone in your system to break down protein. Your body uses protein to build muscle, so the increased levels means this is the perfect time for strength training. 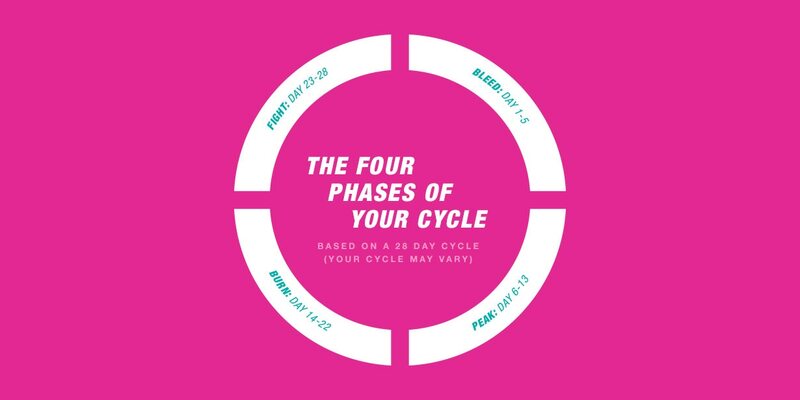 Phase two, from day 5 to 14 of your cycle, is your ‘Power’ or ‘Peak’ phase, where your uterus lining has reformed and you’re at your most fertile. You’ll feel strong and energised as your oestrogen levels are rising leading up to ovulation. So now’s the time to push yourself to work a bit harder than usual in the gym. Or even take the plunge with some boot camp workouts or high-intensity training. “Oestrogen increases the blood flow to the brain and also raises the levels of certain hormones in the body, including serotonin. This is another happiness hormone, so you’ll feel alert, strong and keen to go out and show the world what you can do,” says Georgie. Oestrogen also stimulates the growth hormone, so old cells will be renewed, leaving you glowing with health. And although you may find yourself carrying a little extra fat around the breasts, thighs and buttocks during this phase, it’s completely normal. And all that extra exercise you’re doing will see it off again in no time. So think about doing some longer-distance running and perhaps sign up for a charity trek to keep you on track with your training. Or if you’re more of a gym girl, then endurance reps to improve stamina are the way to go. From day 23 to 28 of your cycle, you’re in the ‘Fighting’ phase. This is commonly known as ‘pre-menstrual’, where your oestrogen and serotonin levels drastically drop. And this can leave you feeling frazzled, stressed-out and generally at odds with the world. Some of us (around 75-85%) will also experience water retention, cramps and aches and pains, so it’s not the happiest time of the month and you could find it tough to get motivated. “Gentle exercise is definitely what you need to get you through this tough phase,” says Georgie. “It increases your endorphin levels, which will make you feel better and more able to cope with premenstrual symptoms like fatigue.” It will also help to counter the food cravings you could be experiencing, so it’s win-win (your body is still burning fat rather than carbohydrates here, so try to go light on the carbohydrates). Remember, don’t push yourself too hard during this phase. After all, you’ve been keeping on track throughout the month, so if you need to take your foot off the gas and recharge, that’s fine: you’ve earned it.